Are the ideas and themes of Night still relevant today? Why or why not? Throughout the unit, Carmen had highlighted examples such as President Trump’s then-proposed ban on Muslim immigration and other issues where students might see a relevant connection between the Holocaust and contemporary events. While there was a smooth transition between the ideas emphasized during the class reading of Night and the ideas that students had to put down in their essays, Carmen felt frustrated during the process and upon reading students’ final essays. Some students wanted to choose “maybe” as their response, most of the students’ arguments sounded the same, and despite her work throughout the unit to connect real world issues to Night, her students’ writing lacked personal connections. Complex Thinking or Plugging in Formulas? This type of breakdown between a well-intended argumentative writing assignment and what students ultimately produce (eg., the lack of authentic or creative arguments; the strength of their arguments) is a common frustration. Teachers often require students pick a side (eg., yes, it is still relevant or no, it is not) and then ask that they compile their evidence to make their argument, possibly filling in a graphic organizer to guide them. This approach to teaching argumentative writing highlights two pitfalls that teachers can easily fall into and which undermine the complexity involved in really thinking deeply about an issue. Choose prompts and frame instruction that allows students to consider the multiplicity of ideas. How can literature serve as a vehicle for social change? How are prejudice and bias created? How do stereotypes influence how we see the world? What role does religion play in a culture? How does the media shape our view of the world and ourselves? These questions do not have singular answers, they would require students to gather data from Night as well as other sources, and consider their own viewpoints about some major issues. This is the type of thinking that expands students’ abilities to craft strong arguments. Structure of Argument: Further, beyond simply choosing great prompts, we must allow for a structure that allows students to explore the complexity of ideas, the range of opinions, and the broad perspectives and life experiences that people have, which are the basis of a solid argument. In other words, an argument in which it is apparent that students truly understand the issue. In which they are doing more than plugging facts into a pre-arranged formula or graphic organizer. We can model this for our students by providing real world examples of arguments and examining their structure: op-ed pieces, speeches, letters, etc. As students compile data, they can sort it by doing a literal moving, cutting, and pasting of ideas so that they are organized in a logical manner. Allow students to seek out and compile evidence first. Research and Writing Process: Instead of requiring that students choose their argument or claim as the first step in the writing process as Carmen did, restructure the process so that this is one of the last steps. Explore first: do research, determine existing data, and understand the audience’s perspective. Then use this information to have students develop their argument. If we give students time to research and dig through the data first, rather than asking them to find data that aligns with their pre-determined claim, they are likely to understand the depth of the issue far better, in the process creating stronger arguments. – considered ample evidence that supports each of the two sides. Any of these steps can be used to help students to craft more well-rounded and authentic arguments. back on their argument, therefore helping them to find and understand the counter arguments. Activities such as debates (where the goal is not just to win), publishing student pieces on a blog or in a newspaper, or to the specific intended reader, help to achieve audience authenticity. These steps also allow students the time to really think through the evidence for their argument and how it might be perceived by others, thus helping them to reach a more complex understanding of the issue. 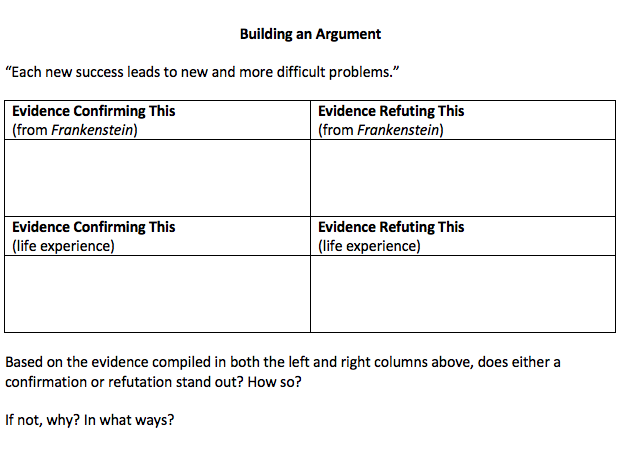 These shifts in thinking about the purposes and processes of argumentative writing in the classroom can help our students move beyond claiming the relevancy or irrelevancy of Holocaust literature to life today. Instead, we can help our students consider for whom, in what places, for what purposes, and under what conditions learning about big issues like genocide, religious discrimination, and dictatorship might still be important in our world. Eileen Shanahan is an Assistant Professor at Eastern Kentucky University. Her research and teaching interests include understanding how discourse shapes teacher learning, teaching English language arts from a social justice perspective, and writing instruction. She previously taught eighth grade language arts in Charlotte, NC where she also served as a middle school curriculum coordinator. Peer-reviewed through the Writers Who Care blind peer-review process.